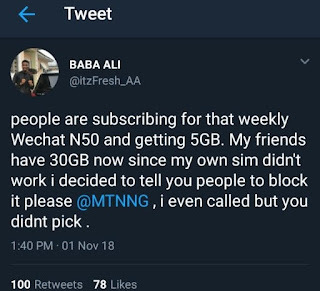 So painful indeed, i can't believe there are still some people in Nigeria that don't progress for the country, How ever we finally confirmed this morning that MTN Wechat N50 for 5GB data has been blocked due to some guy that reports the cheat to MTN NG Via tweeter yesterday afternoon. 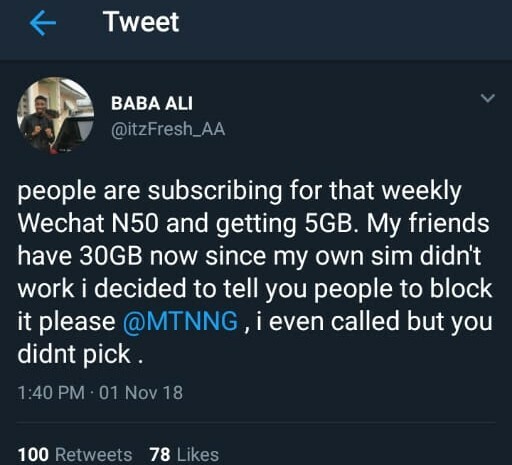 The reports let us know that, Actially, the cheat based on sim selective, and it doesn't work on all sim, so therefore this makes those who are not eligible for the cheat to gives all report to MTN NG official on Twitter with full explanation on how to activate the cheat. The name of the reporter is called Baba Ali, while is twitter name is known as @itzFresh_AA. Actually not because the cheat blocked really pains those who enjoy the benefits. But MTN Nigeria also removed and wiped all thier accumulated data aswell.